Swing sets and backyard play sets are a wonderful way for children to get some exercise, develop gross motor skills, spend some time outdoors, and burn off energy. But they need to be set up properly and used according to the directions, otherwise accidents can and do occur. Possible injuries caused by swing sets include cuts, bruises, pinches, sprains and strains, broken bones, head injuries like concussions, and even death. Accidental falls and strangulation are the most likely causes of injuries, but all injuries are easily preventable by supervising your child to ensure mindfulness and caution when playing. The U.S. Consumer Product Safety Commission’s (CPSC) National Electronic Injury Surveillance System (NEISS) estimates that there were 46,860 reported cases of injuries to children under the age of 18 caused by at-home swings and swing sets that were treated at hospitals in the United States in 2014. The CPSC estimates that about 15 children die each year due to playground equipment-related accidents. The number of actual injuries caused by swing sets is likely to be quite higher than this, as the data from the CPSC reporting system only looked at those injuries that resulted in medical treatment at 100 participating hospitals. Minor injuries, which were likely treated at home or at another medical treatment facility, were not included in the reporting data. 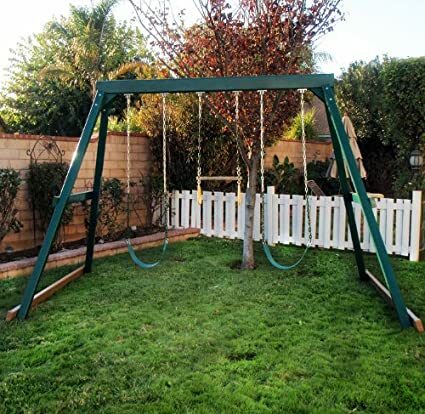 When it comes to swing sets and backyard play sets, parents should always follow the manufacturer’s instructions for use, including proper staking and maximum weight and child limits. Proper installation and close adult supervision is essential for preventing injuries. The CPSC offers an online resource with tips for safe outdoor play equipment use at home. Whenever possible, look for certification by a safety authority such as the American Society for Testing and Materials (ASTM), and be sure to inspect your swing set regularly and maintain appropriately. 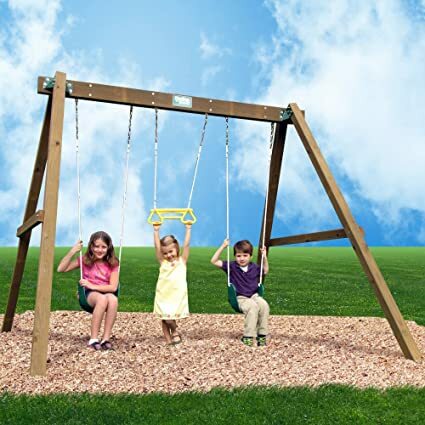 In no particular order, here are the top 50 swing sets that we consider to be the safest, based on available features and average customer reviews and ratings. 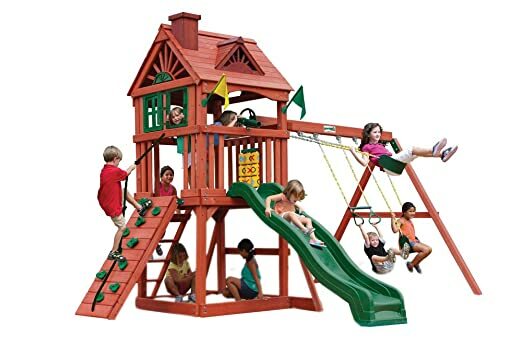 This sturdy swing set features 3 belt swings, a trapeze bar with gym rings, a 9-foot wavy slide, monkey bars, and a fire pole to provide your little one with hours of outdoor fun and exercise. 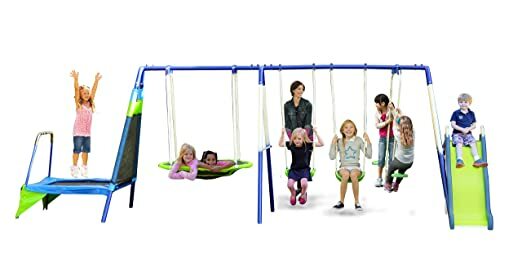 This cute little swing set that is easy to assemble features 2 swings, a trapeze bar, and a low slide for hours of outdoor fun. 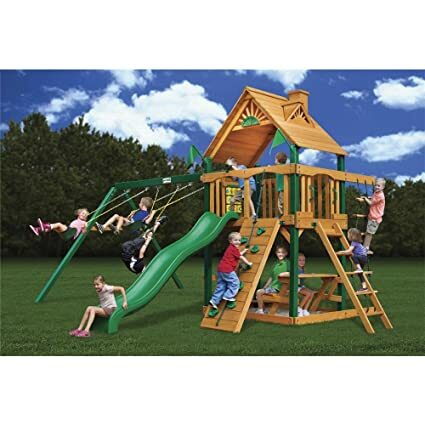 This outdoor play gym features a whimsical tree house shape in fun colors to help fuel your child’s creative play. The high platform, steering wheel, and slide are sure to excite any youngster. 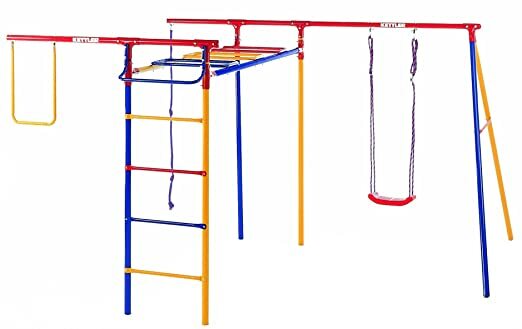 This brightly-colored swing set made from durable, fade- and rust-resistant powder-coated metal features a vertical ladder, monkey bars, a board swing, a pull-up bar, and a climbing rope. 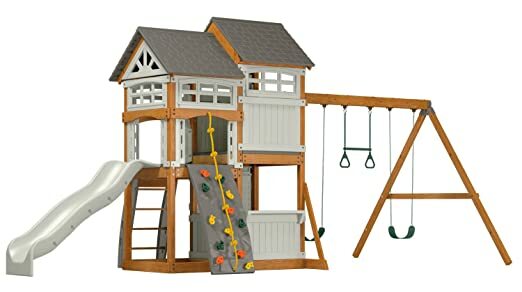 Perfect for little explorers, this outdoor playground comes with 2 swings, a slide, a climbing ladder, and a dual-level playhouse. 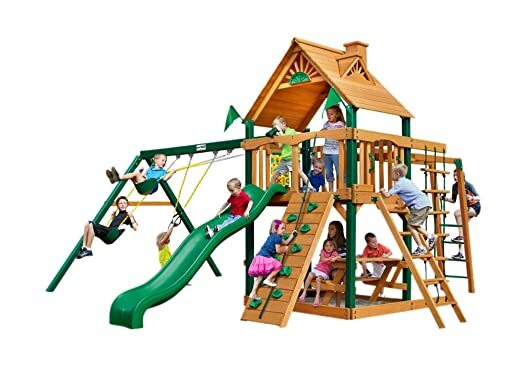 This adventure play center offers a host of activities to keep little ones busy outdoors with swings, a slide, a climbing ladder, and a 2-seated glider. 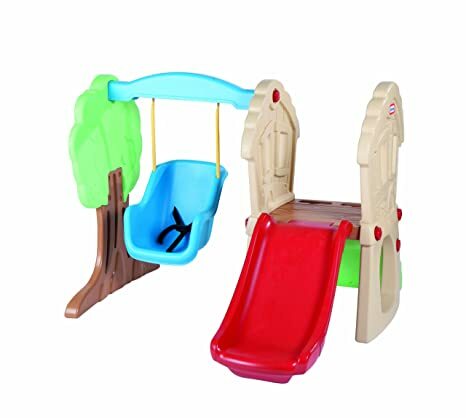 A perfect starter model for the littlest outdoor adventurers, this swing set features a low slide and a swing with a 3-point harness to help keep your child safe. 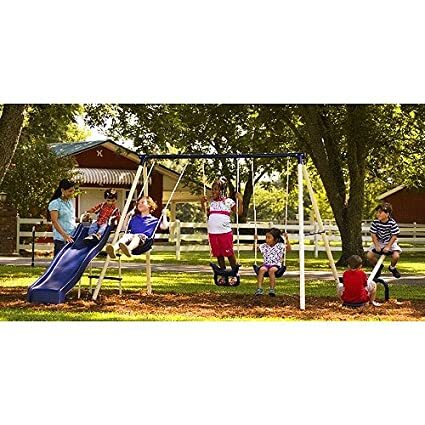 This swing set offers a variety of fun activities to help keep kids active and entertained, including a seesaw, swings, a slide, and a trapeze bar. This metal backyard play center can be used by up to 8 children at a time weighing less than 100 lbs each. With two swings, a glider, and a flying saucer, it provides little ones with hours of active outdoor fun. 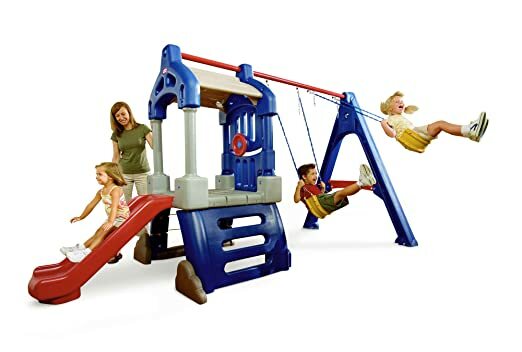 This metal play set features a 6-foot wave slide, 3 comfort seat swings with vinyl-covered adjustable-height chains, and a seesaw for hours of outdoor play. 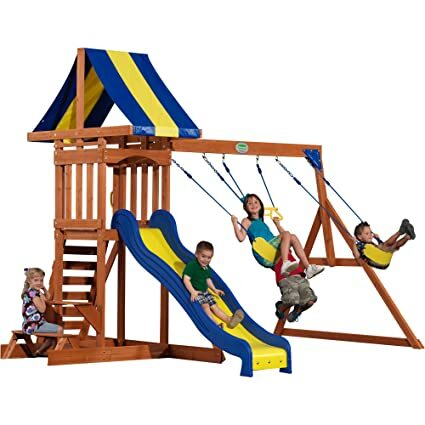 This wooden swing-set kit comes complete with 2 slides, 2 swings, 3 play decks, and a climbing wall, providing endless possibilities for active and creative play. 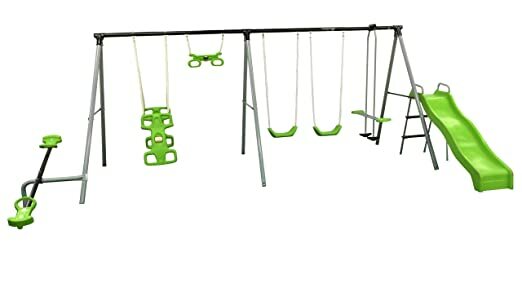 Featuring a powder-coated frame for added strength and stability, this metal swing set offers a variety of activities, including a seesaw, swings, and a slide to keep little ones active and entertained for hours. 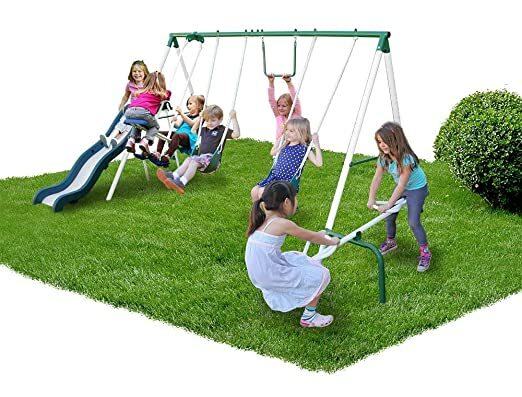 With the inclusion of a trampoline, this swing set offers something a little different for outdoor adventurers looking for even more active play. 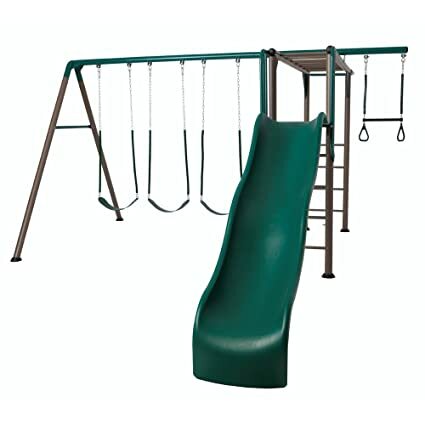 A trapeze bar, 2 swings, and a slide round out this durable unit. 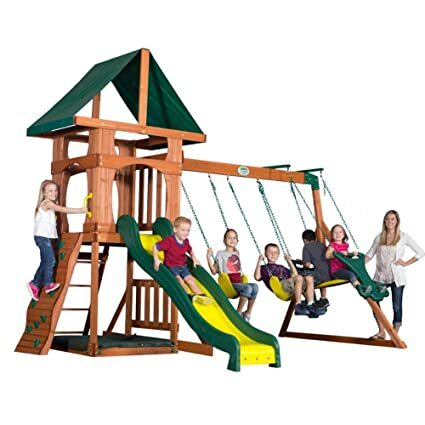 This beautiful wood and resin play set features a multi-position climbing wall, a ladder, and a slide as well as a swing beam for 2 swings and a trapeze swing or rings. 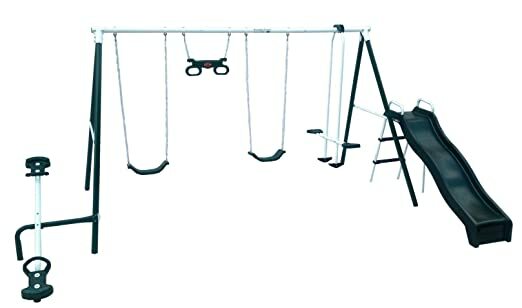 This metal swing set with 5 activities including swings, a slide, and a trampoline can safely be used by up to 8 children at once. 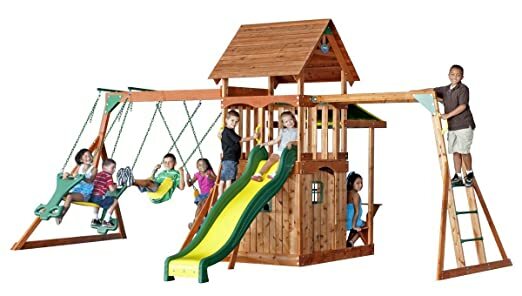 This whimsical swing set offers a host of fun activities including swings, slides, a rock-climbing wall, a deluxe rope ladder, and a tic-tac-toe playing area to keep little ones engaged for hours. 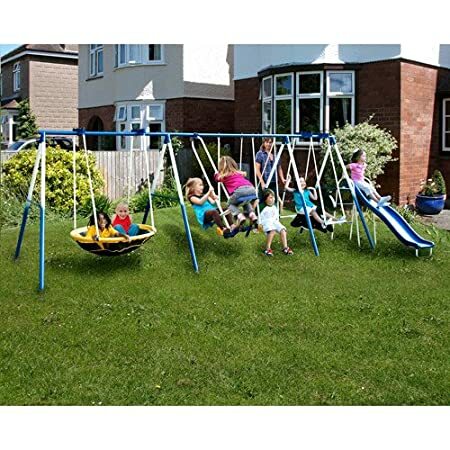 Perfect for larger families and backyard get-togethers, this swing set can accommodate up to 10 children at a time. 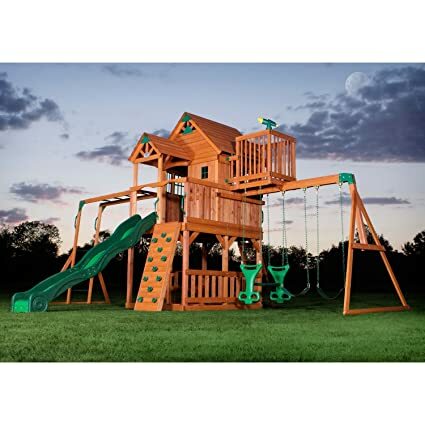 A real showpiece for your backyard, this beautiful, sturdy cedar play set features a rock-climbing wall, a 2-person glider, swings, slides, and more for hours of fun and active outdoor play. 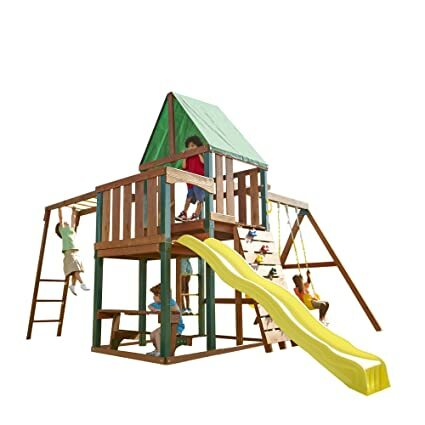 This lodge-style play center will provide your family with years of active outdoor play with 2 swings, a rope ladder, and 2 fort spaces. Double-wall poly construction completes the sturdy design. 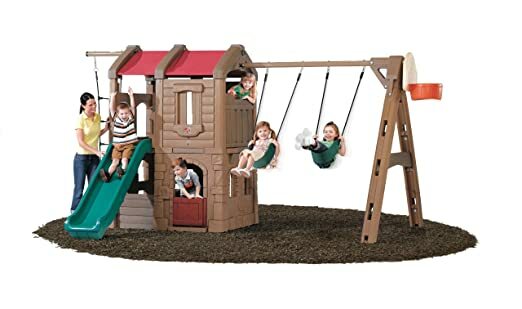 Featuring a rope ladder and a climbing wall to help youngsters develop gross motor skills, this swing set is sure to be a hit with your family. Multiple swings, a wavy slide, and a playhouse round out this unit. 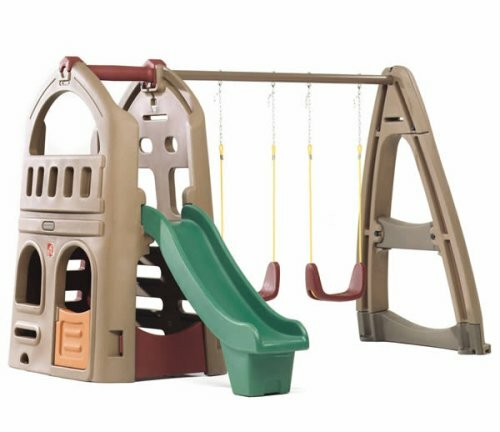 With a wavy slide, a rock wall, a climbing rope, and more, this play set will keep little adventurers active and entertained. There’s even a tic-tac-toe spinner panel for added fun. 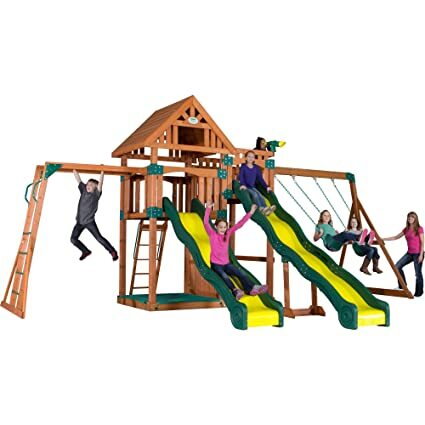 Ideal for little adventurers and built to accommodate up to 4 children at a time, this durable outdoor swing set features a slide, a climbing wall, a rope ladder, and swings for hours of active outdoor play. 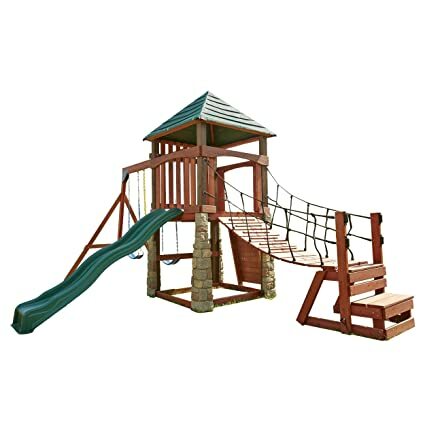 This premium play set made from high-quality pre-cut lumber includes 2 swings, a ring/trapeze combo bar, a tarp roof, a wavy slide, and a rope bridge to help build your child’s balancing skills. 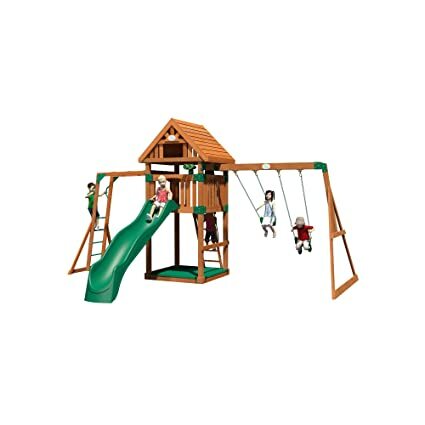 This wooden play set is made from high-quality cedar that is resistant to rotting and decay. 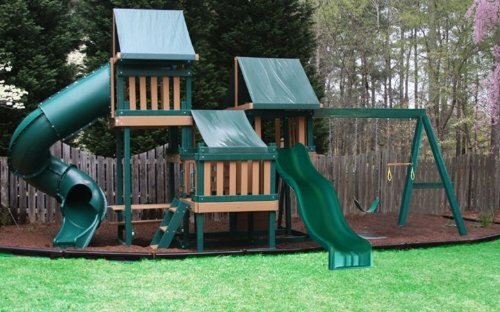 Featuring a slide, swings, and a ladder to keep your kids busy for hours, this unit also includes a built-in picnic table. 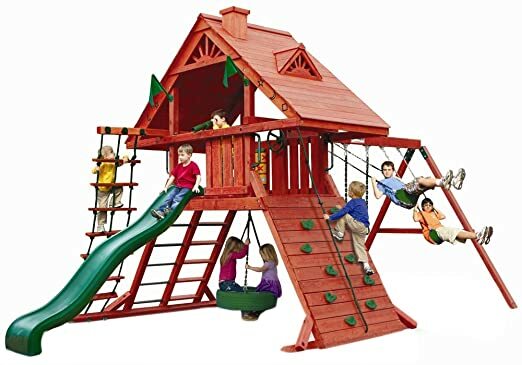 This swing set features a little something for everyone with a tic-tac-toe spin area, swings, a slide, rope climbers, and a beautifully designed roof. It will truly become your child’s palace. Made from Woodguard polymer-coated lumber, this swing set is virtually maintenance-free and won’t give your little ones pesky splinters. Multiple slides, swings, and climbing areas mean they’ll be entertained for hours. 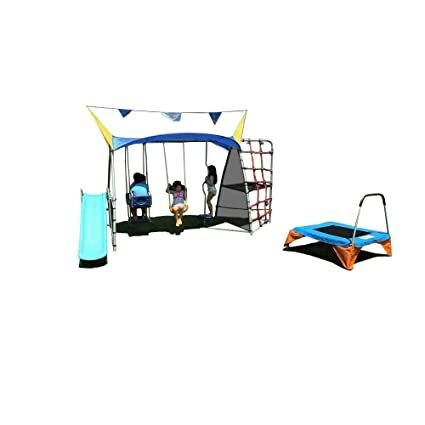 Up to 8 children can enjoy playing at once on this combo set that includes a seesaw, swings, an air glider, a trapeze, and a slide. Vinyl-covered adjustable swing chains ensure little fingers are protected. 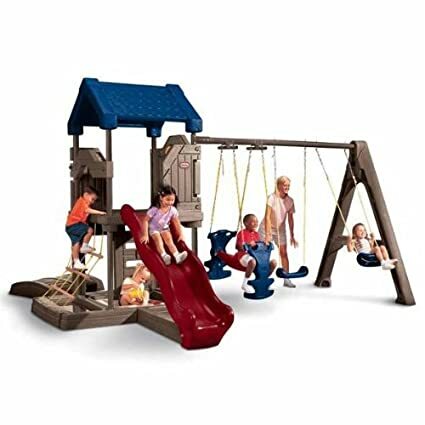 This swing set features a slew of fun activities with swings, a slide, a clubhouse, and monkey bars for hours of outdoor active play. It also includes a covered snack bench for when your child needs a rest. 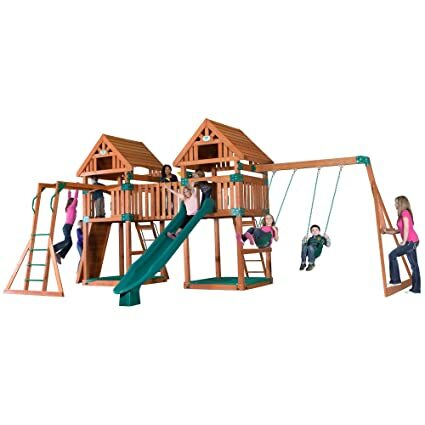 Ideal for smaller backyards, this wooden swing set doesn’t skimp on outdoor play options. Featuring swings, a slide, and a rock-climbing wall, it also includes a covered sandbox for even more outdoor fun. 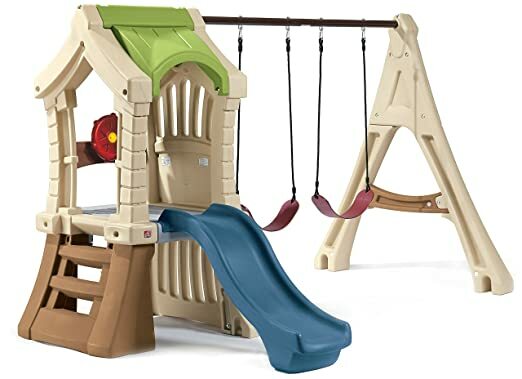 This all-in-one outdoor play set has 2 swings, 2 ladders, a slide, and monkey bars to challenge and entertain your little ones. It also comes with a set of binoculars for imaginative play. 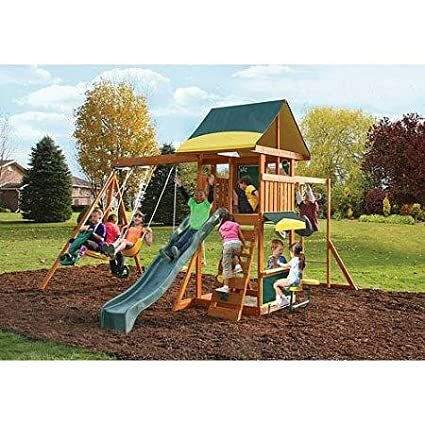 Your children will be able to enjoy active outdoor play all summer long with this quality wooden swing set that features a covered play area, swings, a slide, and a rock-climbing wall. This metal swing set constructed of high-quality, durable, weather-resistant steel tubes will last your family for years to come. This play set’s dual wavy slides mean hours of racing fun for little ones. Various swings, ladders, and monkey bars let several children get in on the fun at once. 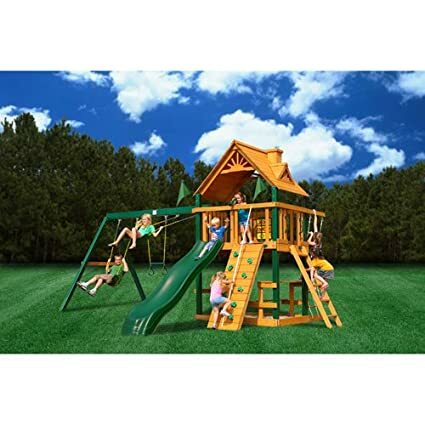 This play set is huge, making it ideal for large families and those with a lot of outdoor space. Multiple towers, decks, ladders, and swings mean your kids won’t say “I’m bored” this summer. 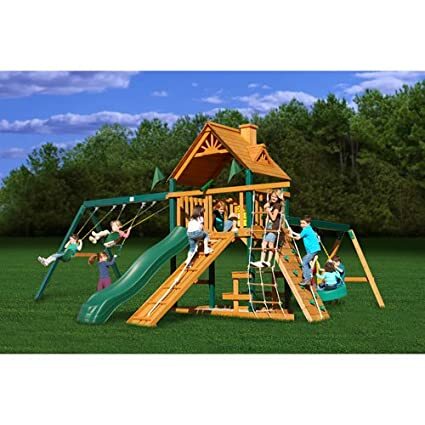 This outdoor play set with a host of popular play areas including swings, a slide, ladders, and monkey bars is expandable so it can grow with your family. This play set has everything necessary to keep your child busy and active this summer. The maintenance-free beams ensure years of outdoor enjoyment and play for your family. 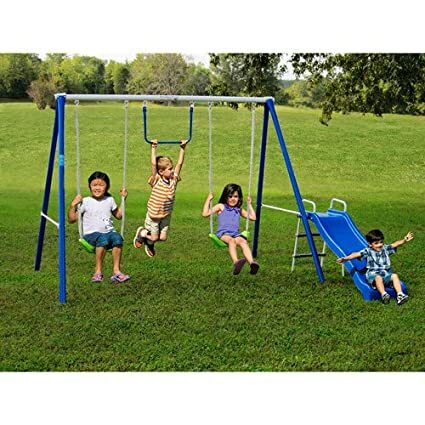 Big enough to accommodate up to 9 youngsters at a time, this metal swing set offers great value for the price with swings, a glider, a trapeze, a seesaw, and a slide. 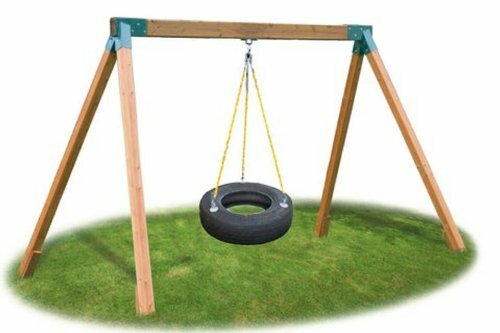 This swing set features durable, factory-stained and -sealed wood that has been pre-sanded and pre-drilled for easy assembly. The swings, slide, and rock-climbing wall will keep little ones entertained for hours. Keep the kids entertained with 9 fun activities including swings, ropes, ladders, and monkey bars. 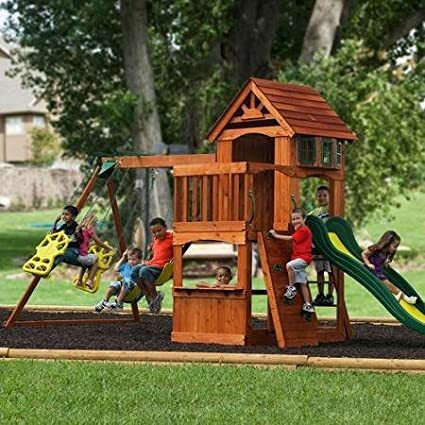 Thanks to the quality cedar construction, this play set will last for years without rotting. 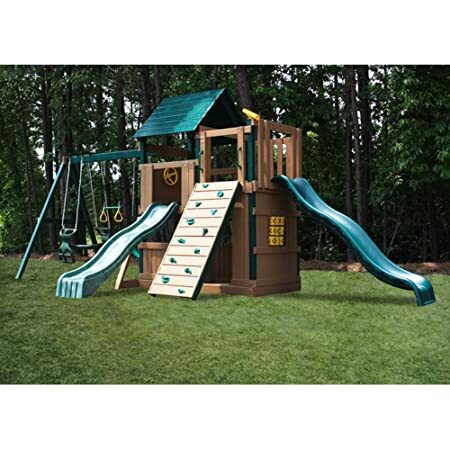 Let the little adventurer in your life enjoy some backyard play with this durable play set that’s practically maintenance-free. The built-in sandbox features a cover to help keep debris and neighborhood cats out. 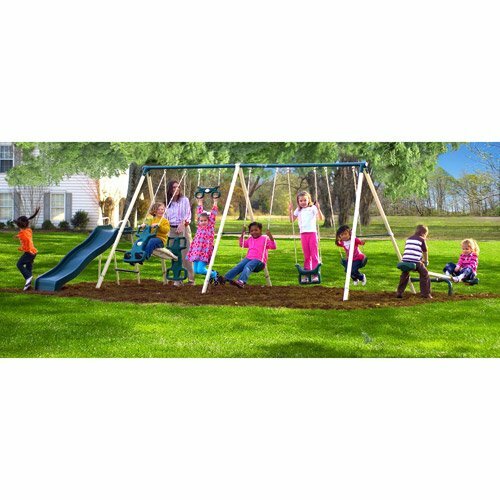 This simple swing set featuring 2 swings and a trapeze bar is customizable so you can create the ultimate play set for your child as your family grows. 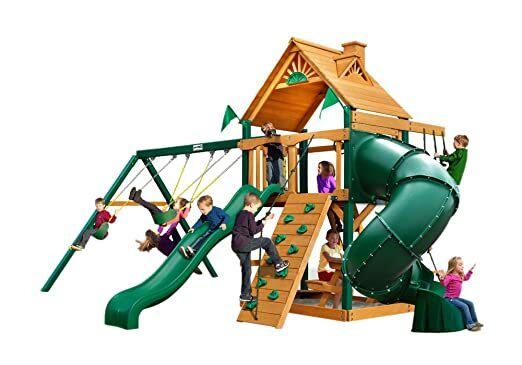 Keep your little ones busy, active, and engaged outdoors with this play set that offers a rock-climbing wall, a slide, swings, monkey bars, and more for hours of entertainment and imaginative play. Offering little ones a safe place to play all summer long, this swing set features a slide, swings, and a seesaw, allowing multiple children to play on it at once. 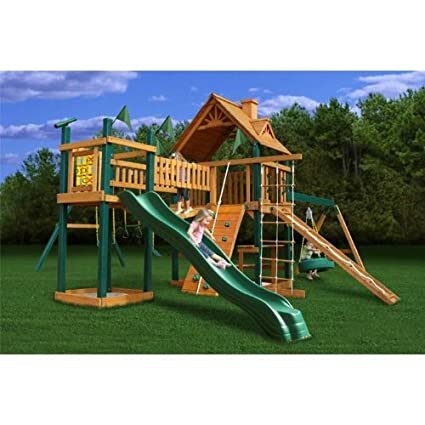 This play set features lumber that is pre-cut, pre-drilled and pre-stained so it’s quick and easy to assemble. Your child will build endurance, strength, and balance by climbing, swinging, and sliding all summer long. Made from Woodguard polymer-coated lumber, this swing set is virtually maintenance-free and won’t give your little ones pesky splinters. 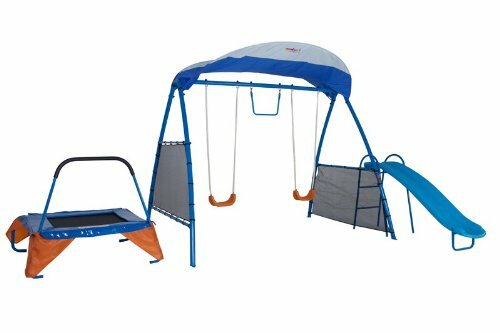 Its simple design featuring 2 swings and a trapeze bar will provide your family with hours of outdoor fun. 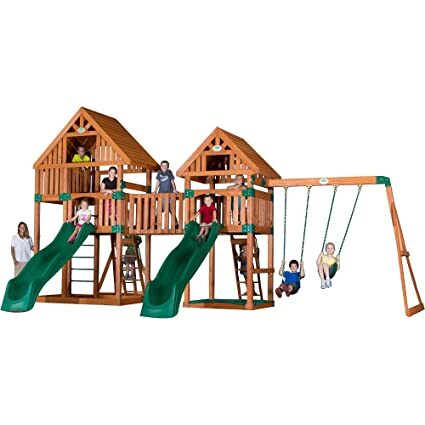 This quality play set will last your family for years to come thanks to its durable factory-stained and -sealed cedar construction, which makes it resistant to rot, decay, and insect damage. With protective poly-coated beams and safety handles, it is practically maintenance-free. We love this basic backyard tire swing for the nostalgia factor. Lucky for us, it’s even designed to handle the weight of a full-grown adult! 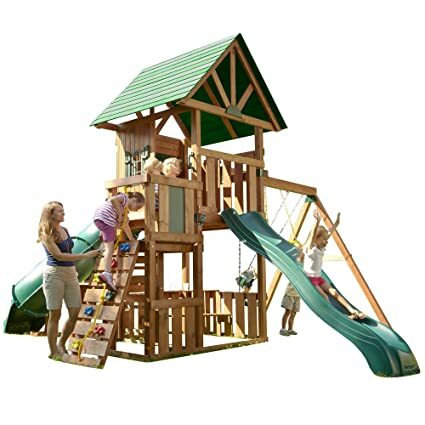 Ideal for smaller backyards, this quality cedar play set features 4 fun activities that can keep up to 7 kids entertained at once. This play set offers multiple ways for children to get active and use their imagination, all while keeping cool thanks to a built-in misting system. Its UV-treated polypropylene plastic features antifreeze protection that is tough enough to stand up to any climate. 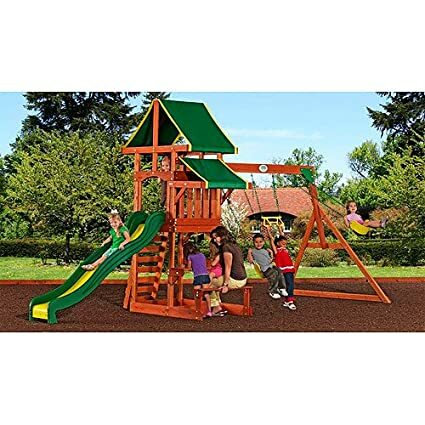 Constructed of durable cedar that is resistant to rot, decay, and insect damage, this massive play set requires minimal maintenance so you’ll have years of active backyard play with little worry.